After Alexander had defeated Darius for the second time at the Battle of Issus, his most obvious strategy would have been to move to the east together with his army and royal hostages, to the heart of the Persian Empire before Darius had time to recruit new soldiers. However he was determined to fulfill his first plan, which was to gain control over the coastal areas. He moved southwards down the Syrian coast. Sidon, Byblos and other major cities surrendered to him without a fight. He reached Tyre in 332 BC and it refused to surrender; thus begins the Siege of Tyre. 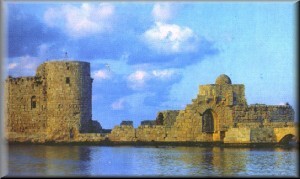 Tyre was an island fortress off the coast of modern Lebanon. It was situated about one half mile off the mainland and the water surrounding it was approximately eighteen feet deep. 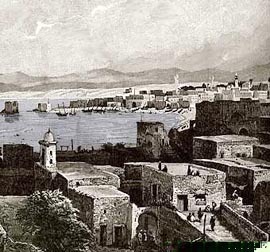 With mammoth walls one hundred fifty feet high, a well fortified harbor, and virtually no land outside the walls, the city was long thought impregnable. 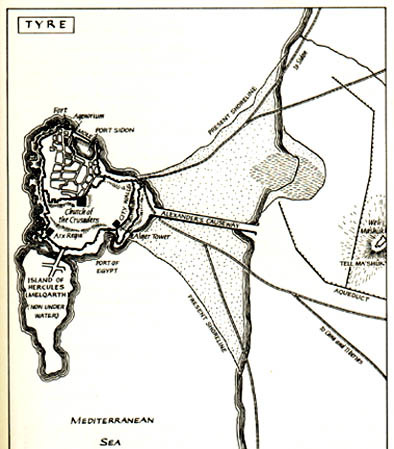 Alexander needed the city to control the Eastern Mediterranian and to provide a secure port through which to funnel reinforcements and supplies. The Tyrians knew Alexander was coming and had stocked up on supplies; it also had its own source of fresh water. 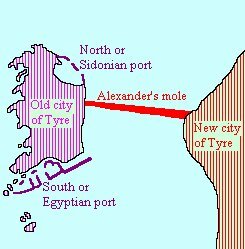 Alexander started to build a two hundred yard wide mole (land bridge) from the mainland to the island, a distance of approximately one half mile. While the mole was being built, he took part of his cavalry and went to Sidon where he commandeered one hundred twenty triremes, which were sailed to and surrounded Tyre. The arch shown above is said to mark the spot where construction of the mole first got underway. When the Tyrians saw the size of this fleet, they refused to fight, leaving it to the Macedonians to try to attack the walls. 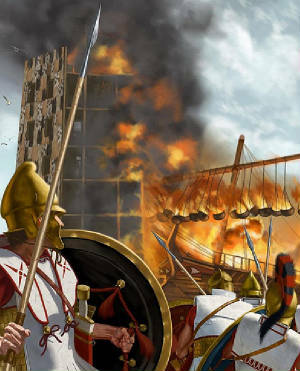 Alexander mounted catapults and siege towers on the decks of the ships but the Tyrians would sink them with huge boulders and would pour scalding liquids and hot sand on them. It took months to complete the causeway and during its progress toward the island, Alexander constructed several one hundred fifty foot tall towers on which he mounted catapults to fire back at the Tyrians. The images shown below are typical of siege machines of this era (circa 300 BC). Finally the battering rams were brought up to the base of the walls and a hole was punctured. After a short struggle, Alexander and his troops took the wall and advanced into the main part of the city. The Macedonians took no prisoners. They slaughtered the Tyrians for two main reasons. The first had to do with the length of the siege (seven months) and the second had to do with the way the Tyrians had treated Macedonian prisoners. 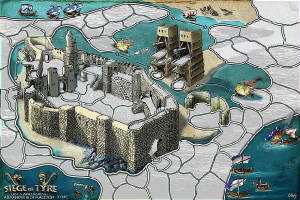 They would bring a captured Macedonian to the top of the wall so all could see, slaughter him and toss him into the sea. More than eight thousand Tyrians were killed in the final attack and the remaining thirty thousand inhabitants were sold into slavery. 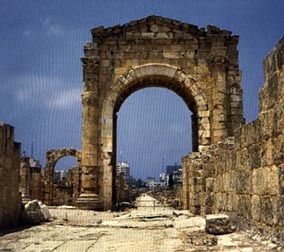 The siege of Tyre had a lasting effect, for the causeway stayed, silted up, and today Tyre is connected to the mainland. Alexander, in his drive to conquer, permanently changed the face of the landscape. It is deeds like these which drive the many legends of Alexander and make him famous from his day to ours. While Alexander had Tyre under siege, he moved along the coast accepting submission of the cities along the Mediterranean. Alexander was on his way to Eygpt. Batis, the commander of the fortress of Gaza, refused to surrender. 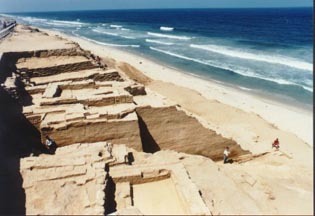 The inhabitants of Gaza and their Nabataean allies did not want to lose the lucrative trade which was controlled by Gaza. 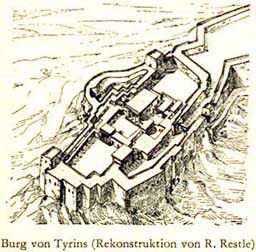 The fortress was built on a hill and was heavily fortified. 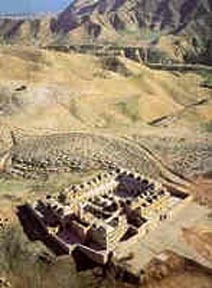 Alexander built ramps up the sides of the hill with debris and utilized the same siege engines that were employed at Tyre. After a fierce resistance of two months, Gaza was taken; the male population was put to the sword and the women and children were sold into slavery. Alexander received a shoulder wound during the siege. In a fit of rage, Alexander is said to have dragged the body of Batis around the walls of the city behind a chariot in emulation of Achilles with the body of Hector. Egypt now was open before him.